On Thursday July 16th, I called Fr. Adrian to follow up on the “correction.” I was told that the correction has not taken place but I could expect it by the July 26th issue of the Umatuna Si Yu’us. I am hopeful that a new decree (without the name change) will be issued soon. Fr. Jeff explained that despite the fact that there was no "correction" in the "July 26 issue of the U Matuna," Fr. Adrian was "working on it." I explained to Fr. Jeff that all Fr. Adrian was "working on" was his next lie. Fr. Jeff declined to say any more...which was a smart thing to do. There really is nothing else to say. Fr. Adrian lies and lies and lies. On Thursday, July 9th I talked to him about why renaming the chapel would be problematic. He reassured me that he understood the issue and that it is not his intention to rename the chapel. The archbishop told me that he had talked to Fr. Adrian about this problem but for some reason it was not immediately resolved. He assured me that it would be corrected. In virtue of canon 1223 of the Code of Canon Law and by reason of my authority as Archbishop of Agaña, I hereby erect the PÅLE’ JESUS BAZA DUEÑAS ORATORY at the Father Dueñas Memorial School in Ta’i, Mangilao....This instrument revokes the previous decree, Protocol Number 2014-022, formerly establishing the ‘Boys Chapel’. Yet, Apuron tells Fr. Jeff that it was not "his intention to rename the chapel." To believe that Apuron is a liar just like Adrian is not hard. The two of them, along with the Vicar General, have demonstrated their willingness to lie to us over and over again over the last two years. "The archbishop told me that he had talked to Fr. Adrian about this problem but for some reason it was not immediately resolved." We all know that Apuron is just a stooge for Adrian, but here Apuron (through the report from Fr. Jeff) makes it explicit. Why is Apuron talking "to Fr. Adrian about this problem?" Wasn't it Apuron who signed the decree changing the name? Yes, but it is obvious here that the decree was written by Adrian otherwise Apuron would not now have to talk to Fr. Adrian about changing it back. But - and here's the big one - since WHEN does an archbishop take orders from his chancellor - apparently signing an episcopal decree against his will? When that chancellor is taking orders from someone that the archbishop also takes orders from. Gennarini and Pius ordered Adrian to write the decree and told Adrian to have Apuron sign it. This is why Apuron says it was "not his intent to rename the chapel." Only the pope can remove a bishop, and normally there either has to be an ecclesiastical crime or a demonstration of severe incompetence. 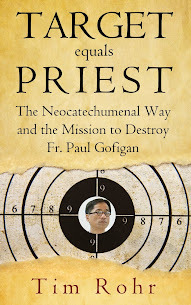 There is no doubt that Apuron was complicit in an ecclesiastical crime - the alienation of the Yona property without the approval of the Holy See - and Rome has all the evidence to act if it wants to. 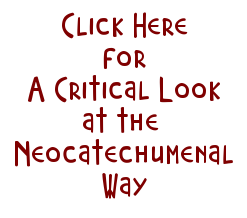 But this particular crime involves the Neocatechumenal Way and the all-powerful Kiko Arguello, so Rome may be looking at a quieter resolution to the problem, or it may just be looking the other way altogether. Such is the dark power of Kiko Arugello. However, with this account of the renaming of the chapel, and the misuse of episcopal decrees, we see here plainly and boldly that Archbishop Anthony S. Apuron, Metropolitan Archbishop of the Archdiocese of Agana is NOT the acting Metropolitan Archbishop of the Archdiocese of Agana. Archbishop Apuron is in a state of COMPLETE INCOMPETENCE and the authority of his office is being used by the intrepid Gennarini-Pius machine via the arch-fool Adrian. This is an even greater grievance than the stealing of the property. Impostors are running the church on Guam, and the church in Rome had better pay attention because the eternal welfare of many souls is at stake. For if what we have here is truly an INCOMPETENT bishop who is abusing his authority and the souls in his care (as if there can be any doubt), then Rome (specifically the pope) becomes the COMPETENT authority and must intervene to prevent the abuse of episcopal power, the further destruction of the church, and the loss of souls...souls for whom the Holy Father will have to answer. Such is the hard duty of the pope...which is why, upon election, new popes are immediately taken to the Room of Tears and left to weep over their terrifying duty - a duty a certain Cardinal Bergoglio avoided in 2005 when he reportedly begged God not to be elected pope, but a duty he did not avoid eight years later. And with the church on Guam, there is a very great duty...and very much to weep about. Thank you, Tim for this in depth analysis. The way you analyze this only means you value every word you say. Incompetence? At the very least there is some excessive and imprudent delegation going on here. One might delegate authority and duties, but there can be no delegation of accountability. If the Archbishop is not complicit, we would feel sorry for him. Tony put on you "big boy" pants and for once stand up to your puppeteers if you have an ounce of decency. You have already been totally humiliated by blindly following their directions and have left you with a dark legacy that will be a part of the church history of Guam. If I were in your shoes, and now you have seen the destruction their Cult have done to our Church. You have already gone down in flames, so if I were you, I would do the only decent thing for you to do is to expose Kiko and his group. This way you can pay back some of the humiliation they have caused you and will win back some for taking such action. Would you be man enough to do it? Pray for Guidance. I used to hold out some semblance of faith that there still may be hope for the archbishop to turn things around too, Neo-Free Guam July 27, 2015 at 5:18 PM. I was hoping this primarily because I remember him before he became involved in the NCW and because he used to be quite the advocate in the church for the Chamoru language and culture. However, after all that has been revealed here, well-documented for our perusal and conclusions, I have lost hope in him as our spiritual leader. You suggested a "saving face" move, though I would like to add my own wish/desire/dream. I'd like to imagine that we can somehow arrange for an intervention where we take him aside off-island (perhaps when he is on one of his many excursions) and have old friends, relatives, fellow Capuchins, people that he used to respect, just tell him how much he has hurt us all and shower him with love, prayers and revelations. A pipe dream? Perhaps. Just trying to find a way out of this whole mess of lies and corruption. F.Leon Guerrero, totally agree. Archbishop can you not see that although we abhor the things you have done to our Church we still are hoping against hope that you will return to your roots, your sheep and although we have been abandoned there is still in our hearts our wish for your redemption. Think about it, our Faith can only last so long,before reality sets in, that you have indeed abandoned us forever. Think about it. One thing for sure is that when AAA leaves this world, he will be in a place where there will be weeping and gnashing of teeth! i was going to ask if the "expected" july 26th correction was published in the u matuna. of course, as usual, the cast of characters in power are counting on people's lack of persistence. they're relying on short attention spans making this latest outrage go away on its own. The JW has exposed an ocean of red flags that normal process of litigation and institutional condemnation would long ago have concluded. Vatican Leadership which oversees the global reach of the Catholic Church will not act unless these flags are dipped in the blood of those who are crying out for a sane leadership, a veritable accounting of resources, and an end to a harmful movement that has divided the Faithful of a small island in the Pacific. Must it come to that? If it does, Rome will have more blood in its hands.